Eumir Deodato, a name like a peal of thunder. This Brazilian musician, record producer and arranger is best known by his Grammy awarded funky version of Richard Strauss' Also Sprach Zarathustra, the theme to 2001: A Space Odyssey. With combined sales of more than 25 million records he earned 16 platinum records and worked on more than 450 albums. With such an impressive reputation every new solo release of this blessed artist is a highlight in contemporary jazz history. 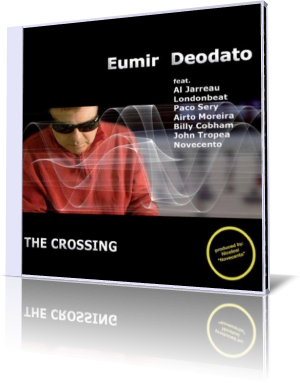 On July 12, 2011 Eumir Deodato released his newest album The Crossing. This album features artists like Al Jarreau, Paco Sery, Airto Moreira, Bily Cobham, John Tropea and the groups Novecento and Londonbeat. With his ultimate instinct for captivating hits Deodato created with Al Jarreau and Nicolisi the breathtaking song Double Face. Melting Al Jarreau scatting vocals with Deodato's vintage Rhodes piano delivers a flabbergasting piece of music art. The love ballade I Want You More features songstress Dora Nicolisi, a beautiful voice that has affected the environment, together with Al Jarreau just adorable. The Crossing presents the members of the group Londonbeat Jimmy Helms and Jimmy Chambers. This UK and American R&B and Dance band scored a number of pop and dance hits in the early 1990s. Helms raw vocals give this song a cutting edge. Shining in great elegance Night Passage let you feel the great flow. Into the mellow collage of flute, flugelhorn and Rhodes piano breaks John Tropea's solo guitar playing, creative, musical, and virtuosic as he already showcased on 2001. No Getting Over You brings anew more of Deodato's rock side highlighting Jimmy Helms remarkable vocal interpretation. Summertime, an inspirational re-working of the Gershwin original, is the perfect platform for Deodato's chops. Dora Nicolisi takes the lead on Rule My World again. Some phrases are intermediate. The Santana influenced Border Line features Brazilian percussionist Airto. Pushed by the Latin rhythm Deodato excels on his magic Rhodes. Eumir Deodato is one of the world's top five keyboardists. Listening to The Crossing is believing. A masterwork of its own class.